[prMac.com] MacBreakZ is a sophisticated Personal Ergonomic Assistant designed to promote healthy and productive computer use. It uses a sophisticated activity monitor to minimize disruptions by ensuring that the user's activity level justifies a stretch, rest or micro-break. While this is optimal for preventing mouse and keyboard-related repetitive strain injuries without reducing short term productivity, individuals who are more concerned about postural problems, eye-strain or headaches, can benefit from a more regular stretch break schedule. 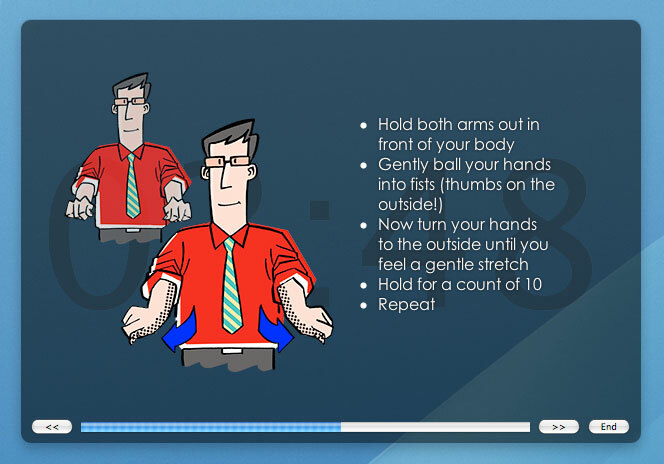 MacBreakZ has long acknowledged that each person is unique and requires individualized ergonomic assistance, but in past releases individuals who make very sparse use of their input devices could go for long periods without any stretch breaks being triggered. For these individuals, version 4.5 allows some of the activity monitor features designed to minimize "unnecessary" rest breaks to be switched off.